First of all, I apologize for the delay! This semester I started teaching undergraduates, so had to prioritize things and the blog took a backseat. However, I am going to publish a story soon! This is what I will do when I take a break from studying, I think this will be more productive than Facebooking. Today's story has been shared by Sourav Kumar Das aka SKD! Thank you for sharing this beautiful story with us. 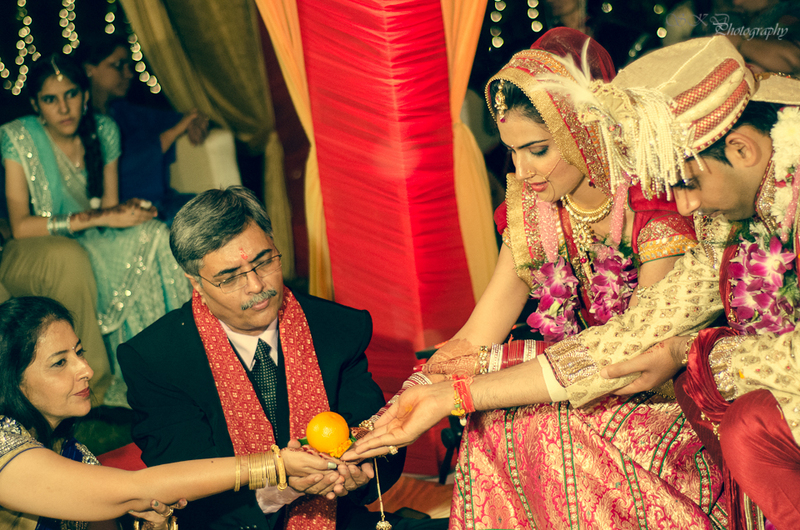 This is Astha and Karan's story, theirs is a wedding with the modern-thinker twist. The bride definitely defied some norms of the society (I totally relate to her, being a rebel myself :P). Here is a bride who wants to do things her own way, she took the road less traveled. "For my entire costume and jewelry, I made no special arrangements. I just went to Chandni Chowk, Delhi to find myself a dress that feels right for the day. It took me only 2 days to decide and finalize my attire." (Way to go girl! In American slang: You do you!!). "Not that I wasn't excited as other brides are, LOL (she actually laughed out loud :D)! Just that I believe spending too much time over attire wouldn't have been worth when I had limited time to spend with my family before I left the country for good". I was already in the UK and was visiting India only for 1 month to get married hence prioritization of tasks was very important" she elaborates. (I totally agree with Astha, I would give myself a deadline too because there would definitely be other important things that need my attention). Neither did she go for any of the pre-bridal makeup courses (Gutsy!!). Normally, I would suggest all brides to get a trial or get training on makeup, so that they can do their own stuff. But as I said, this is a wedding with a twist, so definitely you can make an exception if you are confident about it. "What made me look beautiful on my special day was the feeling of getting a new version of identity with the love of my life" says Astha. The bride ended this question with a tip: "A good photographer, like mine - SKD, will do you wonders, because an artist will capture your natural self and mirror you in all the pictures which you later discover were the wondrous moments"
The bride chose VLCC in Gurgaon and had made no special appointments for her makeup or dress up. Astha met a kind lady there who said she was meeting the most sorted bride ever! "I mean I had just met her that day and all I said to her was: do what you are best at, and she laughed. Took us about half an hour to get it done with and I was ready! Stunned at myself" she laughs. Another tip by the bride at the end of this question: The less you desire, the more amazed you are because just a little makeup with the right expression can do you wonders. So it is important to relax! Its your day, you ought to look beautiful. Let go and you will enjoy each moment, feel every stroke of brush on your face and taste some lipstick to realize the sense of a bridal makeup!" (I think "do you wonders" is her favorite phrase, I keep it real guys, even if I edit the stories). A shout out to the photographer: "As Astha mentioned earlier, photography is among the few big decisions that need to be sorted and agreed by most importantly both the bride and groom. We have forever memories made by SKD! Proud of that!" says Karan. 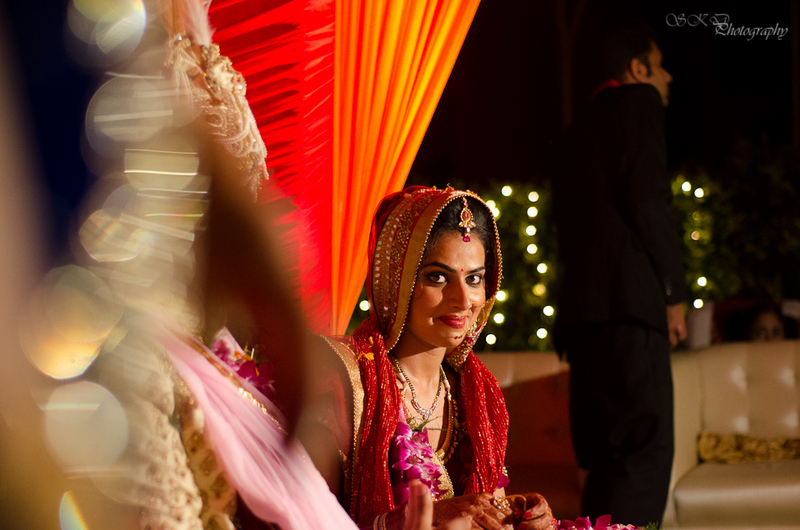 Their wedding was held at a place called Nidra in New Delhi. It is now acquired by Marriott and is in the 5 star league if that's what you are looking for.The food was amazing which is not a surprise as the place is known for delicious food specially for big ceremonies. The couple had specially hired Khan Market, Delhi to cater to guests who were more interested in snacks than meals. The wedding was a fun Band Baja Barat kind of an event without a wedding planner. The couple had hired exceptionally good event organizers in form of vendors like the hotel/photographer etc. all they had to do is select the colors, cuisine, stage setup from a variety of options offered to them. "These days with decent money in your pocket, all you need to do is have two meetings or so with the event managers and its all sorted. For both our families it was almost like going to an organized party, with no hassles at all. Totally loved it and was worth the money" says Karan. The newly weds are engineers by profession. The groom is a mechanical engineer while the bride is a software engineer. He works as a project manger in the TurboEngine section of Caterpillar, UK and she works as a Network Consultant with a company called Advantage Technologies. 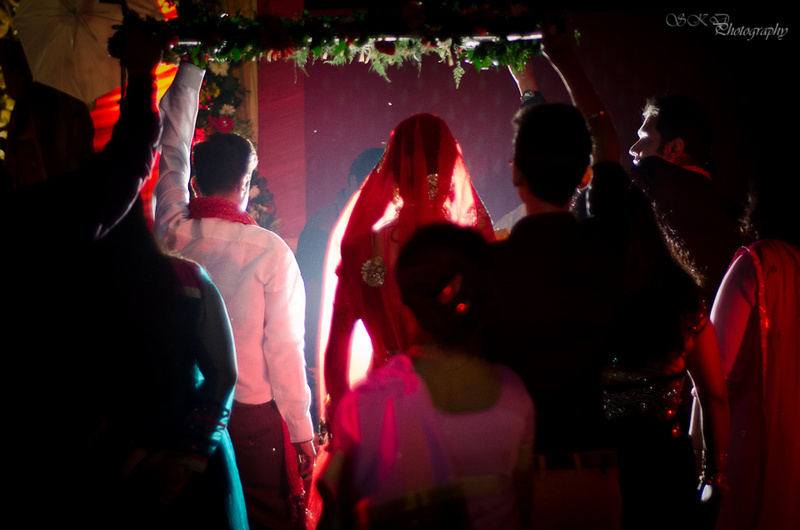 They met about 3 years ago and were introduced to each other by their families for an arranged marriage. Karan flew to India sometime soon after they were introduced over emails and phone calls. Astha was working with TechMahindra, Pune then and requested her family to permit her a personal meeting with Karan in Pune. Both the families agreed and Karan went to Pune to meet Astha for the first time. (As the bride is unique, she wanted to share another section with the readers, she calls it fun facts!). "I was agape when I first saw him at the airport as he is 6 feet 4 inches and I am thankfully 5 feet 7 inches, that enabled me, without much neck exercise to get used to him in personality. And for him, the first thing he said to me when we met was "you look just like your mother". This might not surprise you but to me it was the most beautiful statement a guy had ever said to me. At that instant I thought, someone who had just met my mom once has the eye to remember what she looked like and see her in me was really beautiful". "Since that trip there were many more trips and endless hours of romance that we shared through all possible means of communication you can imagine. I loved him every minute from then as I recall and his gentleness is what completes me!" "We strongly believe that it is more important to respect humanity than to be deluded by materialism. We travel, eat, work, laugh and love like kids! Two souls that were, as they say, meant to be together!!" Sourav says "Oh they are a beautiful couple! Astha is already a great friend of mine and shooting them was a lovely experience for me. They were so much in love. That made my work very easy. The best thing which I enjoyed in shooting them was they were elated to start their new journey. That made me shoot with great happiness and satisfaction. 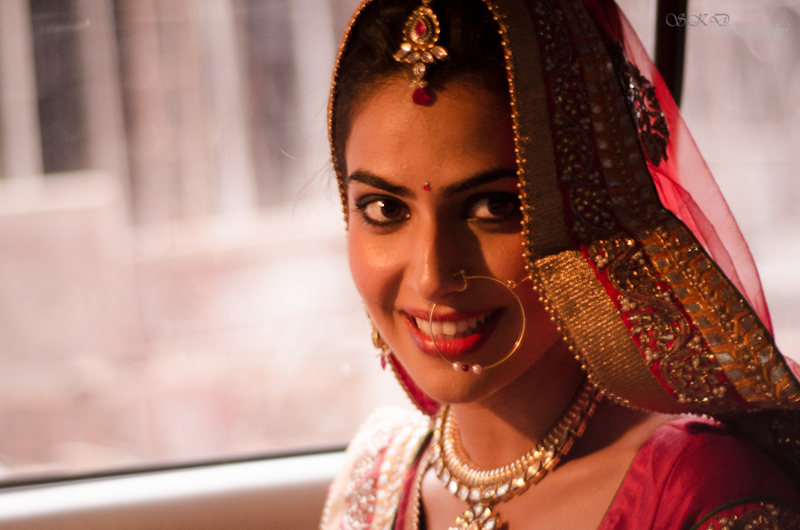 Astha is the most beautiful bride I have ever shot. She was always smiling and sometimes posing for the camera. Totally enjoyed the shoot." 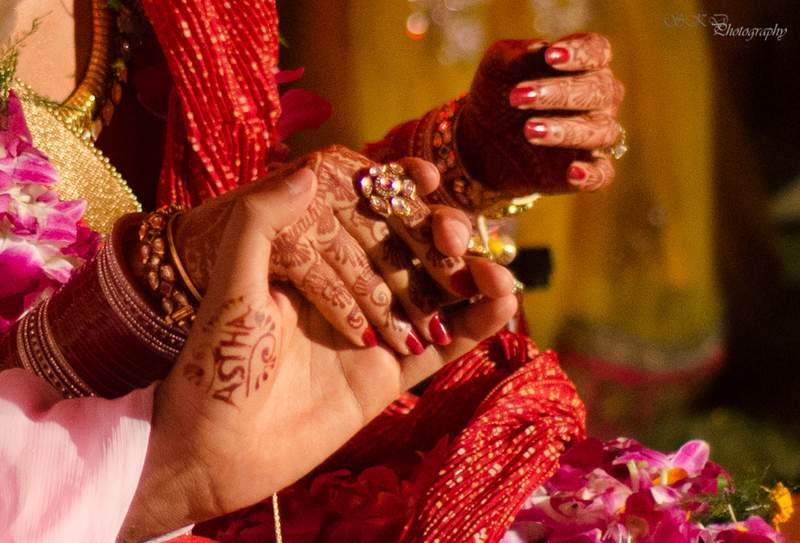 Sourav has many favorite shots from this wedding but the most special to him are the Haldi clicks. 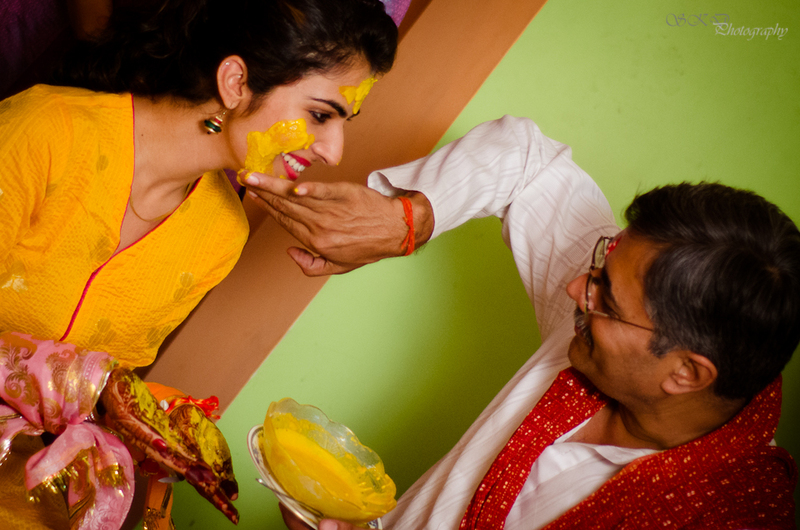 Tears in eyes and smile on her face when her father applied Haldi (Extremely emotive I must say). His another favorite is a solo pic of hers in the car in which the light source was the flash of an iPhone. He ends the interview with an awesome message for the couple: "They are a lovely couple and a couple in love. Wish them a lot of happiness.God bless them. Whenever I see their pics, they bring a huge smile on my face. When you see love, you are bound to smile". Thanks a lot for taking the time to share this guys! As beautifully as it is written, it feels like icing on the cake...having to read our own story through the web! I love hearing how brides and grooms make the day their very own, and don't need to be held with all the traditional rigamarole. Beautiful photography, Karan is such a pretty bride! I love hearing the stories of couples! Beautiful photos, beautiful couple, beautiful blog post. I wish them a lifetime of love and happiness. This story melted my heart, so beautiful, you can feel the love through the entire wedding planning/engagement. They are truly in love with each other. The couple displayed their value of family, and coming together as one. Such a breath of fresh air to hear a bride describe having a no fuss/no nonsense planning process. The wedding photography is beautiful, and again thank you for sharing! thanks for sharing this information. it is a very wonderful blog information. this information related by best photos and photographers. Photo facial (With IPL), Low Level Laser Therapy (Hair stimulation), Tattoo Removal (with ND -Yag Q-Switched).